We happened to be in Target tonight, so I walked over to the 2011 Heritage and checked the codes. Sure enough, there were a slew of "1849's" and a handful of "1922's." I picked an 1842 and my son said, "You better grab a 1922, too. Just to see. It might have the 'hit' in it." I'm game, why not. 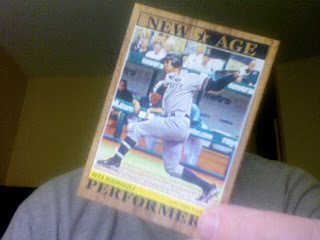 I also grabbed a pack of Panini Michael Jackson cards. I know, it's a sickness, really. The 1849 yielded NOTHING in the way of short-prints, inserts, or anything else beyond standard-issue cards. Ah well, since Chris (at Stale Gum) had already busted the myth and found "dead packs," I wasn't holding out much hope anyway. The "1922" pack gave me a "New-Age Performers" A-Rod. I guess that's a "hit." 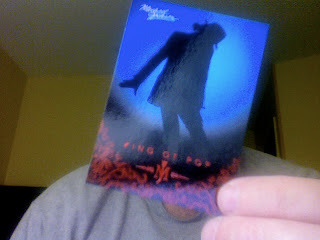 As for the Michael Jackson cards, I pulled a pack that had a thicker feel than the others. I should have known better. The thick cards was a blank filler. So much for my pack searching ways. The MiJac cards are actually pretty nice. The "King of Pop" and "MJ" logo are in red foil. The photos are shots provided by Bravado Media/Merchandising and Triumph International (the studio formerly known as MJJ Productions before his passing). While in the hotel where we are staying, I saw some Arkansas Travelers schedules. I snagged a couple. If you collect minor league schedules, let me know and I'll ship one to ya, free for the asking.